Ginger's health benefits were well known in India and China since the beginning of their recorded histories. Soon after the destruction of the Beis haMikdash, ginger was introduced to Persia by traders where our sages in exile Bavel were among the first outside of the Far East to recognize ginger’s medicinal value. 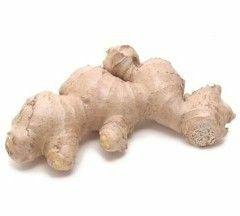 The Talmud (Pesachim 42b)states that moist ginger is one of the few ailment relieving foods that does not have a negative side effect on the body. Wherever Jews lived, it played a role in healing. We have touted it an effective treatment for maladies from nausea to migraines to rheumatism. Yemeni Jews ingested a mixture of ginger and cinnamon to improve sight and combined it with honey to relieve hoarseness, coughing and congestion. The Jews of Kochi, India drank a concoction of fresh ginger juice, cognac and salt to treat diarrhea. A cloth soaked in the juice was used to ease headache, muscle and joint pain. Applied to the temples as a paste, it tended a headache. In Iran, Jews pressed the ground root inside an aching tooth. Rambam classified it as a “hot” food. This means that the ginger health benefit is most realized when eaten during colder months as is speeds up the metabolism and keeps one warm from the inside out. He also included it as an excellent digestive aid. If for one this reason alone, ginger root should be included in every household’s medical arsenal. The root contains compounds called gingerols and shogaols that relax the intestinal tract and soothe symptoms of a variety of stomach ailments. Ginger tea (hot water steeped with a few slices of fresh ginger) is indisputable in its ability to alleviate nausea and accompanying maladies caused by illness, seasickness and pregnancy. The folk cures above are espoused today by many cultures. Modern science has not debunked these time-honored remedies. In fact, scientific evidence concludes that ginger benefits health by addressing a variety of diseases. The fields of cardiology, nephrology and cancer research have funded studies that indicate ginger helps to lower cholesterol, strengthen the liver and kidneys, and is effective in safely killing off pre-cancerous cells. What more can one ask for from a lowly rhizome? Lots! Lots of flavor, lots of forms, and lots of versatility. It has been called peppery and pleasant, hot and vibrant, spicy and sweet. Ginger adds authentic zest to food. The sharp flavor associated mellows when cooking with ginger. The spicier you want the dish to be the later you should add this seasoning. You'll find the fresh taupe tubers piled in the produce bins, the powdered form in every spice section, and for a real treat, buy a jar of the crystallized slices to use in baking. Each form offers the home cook a variety of opportunities to include ginger health benefits in dishes her family will enjoy. It is important to know that one form usually cannot successfully be substituted for another. Fresh ginger’s papery skin is easy to peel with a vegetable peeler, but it is difficult to shred the fibrous flesh using a shredder. Chopping with a large, sharp knife works best. I keep 1” chunks of unpeeled ginger in a plastic bag in my freezer, that way it’s ready to use when I need it. Freezing also breaks down the fibers making the juice easier to extract. One inch of whole ginger equals about 1 tablespoon peeled and minced. A few slices enlivens tea, lemonade and fruit juice. The powder adds a sweet heat to cooked vegetables and baked goods like Gingerdoodles. Crystallized slivers inserted into the flesh of a roast or added to a chicken recipe make a tantalizing main dish. Marinades and salad dressings, chutneys and soups like my Harvest Bisque (a savory soup using butternut squash in Cooking for the King, volume one) become remarkable with the addition of this humble stem. Not many foods can claim to provide such myriad of culinary opportunity and also help us better serve Hashem. How does ginger help us be a better Jew? Maimonides says that when a person is well, he is best able to serve his Creator. When our food digests efficiently, our blood flows freely and our bodies are strengthened to fight off infection and inflammation, we are more likely to be ready for the next mitzvah or chesed that comes our way. Now we can see how our Father lovingly created ginger health benefits: a rare food that is "good for this and good for that."